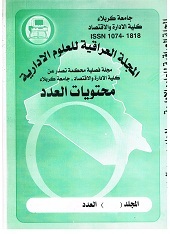 المجلة تصدر عن جامعة كربلاء / كلية الادارة و الاقتصاد من سنة 2001 و تصدر كل ثلاث اشهر عددا اي سنويا اربعة اعداد ، اختصاصاتها هي نشر بحوث العلمية و انسانية من البحوث التي تنشر هي (الاحصائية و المحاسبية و الجودة و الادارية و الاقتصادية ) و صدر الى الان 14 مجلد و 58عددا . Magazine published by the University of Karbala / College of Management and Economics from the years 2001 and published every three months, any number of four numbers per year, its mandate is to publish scientific research and human research that is published (statistical and accounting, quality, administrative and economic) and was released to the now 14 folders and 57 in number. Scientific journal used for the purposes of promotions published scientific research in the field of law and political science under the terms of the copyright. مجلة علمية محكمة تستخدم لاغراض الترقيات العلمية تنشر البحوث بمجال القانون والعلوم السياسية بموجب شروط النشر الخاصة بها . Scientific journal issued by the College of Pharmacy University of Karbala Date first number was issued in 2010 Numbers that are published in the year (1) Publications which topped during the period between 2010-2012 (3)issue. مجلة علمية محكمة سنوية تصدرها كليةالصيدلة/جامعة كربلاء تاريخ اول عدد صدر سنة 2010 عدد الاعداد التي تنشر في السنة(1)عدد عدد الاصدارات التي تصدرت خلال الفترة بين 2010-2012 هو (3)اعداد.